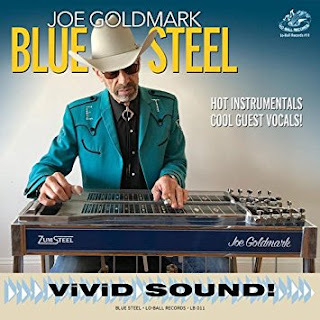 I just had the opportunity to review the most recent release, Blue Steel, from Joe Goldmark. Opening with instrumental, Night Flight, Joe Goldmark showcases his steel guitar craftsmanship on a modern country/jazz track backed by Paul Ravelli on bass, Tony Lufrano on keys and Gary Potterton on guitars. On Rufus Thomas' All Night Worker, Goldmark shifts into R&B mode with Glenn Walters on lead vocal and maintaining his just this side of country edge on steel. Jimmy McCracklin's The Wobble is high energy with DeWayne Pate on bass, Henry Salvia on keys and Rob Sudduth on sax. Very cool. Lefty Frizzell's Look What Thoughts Will Do, is pure country and my choice for best track on the release featuring Dallis Craft on lead vocal and authentic country steel swinging by Goldmark. BB King's Beautician Blues has a great swing with Glenn Walters on lead vocal this track has a swinging blues style. Very cool. Slow country style instrumental, I Want To Be With You Forever, has the texture of a Patsy Cline classic with solid country aesthetics.